John will be entering the third year of his PhD program at McGill University. 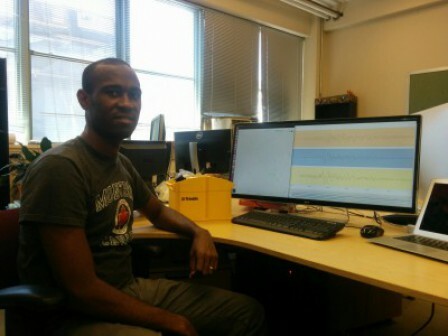 He is focusing on source parameters of both natural and induced earthquakes under the supervision of Prof. Yajing Liu. John became interested in studying earthquakes following the M8+ 2004 Sumatra earthquake. Though born in a country that is seismically 'quiet', he wanted to learn more about earthquake processes and engineering best-practices that would minimize the impact of damaging earthquakes. He completed his undergraduate study at Federal University of Technology, Owerri in Nigeria, and his MSc in geophysics at the University of Western Ontario. During his MSc, he investigated site response at Katmandu, Nepal, following the M7+ 2015 Nepal earthquake which further encouraged him to pursue his long-held ambition. At McGill, he is working on source properties of earthquakes in both intraplate and interplate tectonic settings at several locations in Canada most importantly seismicity related to hydraulic fracking in northeast British Columbia. The goal of his project is to investigate characteristics of earthquakes in both tectonic settings, effects of stress perturbation on seismicity, and their implications for seismic hazard. Earthquakes occur both naturally, and in response to stress perturbation due to reservoir stimulation during enhanced hydrocarbon recovery and waste-water injection. In the last few decades, several studies have shown clear correlation between reservoir stimulation and seismicity. We often find that the regions affected by events due to anthropogenic activities were hitherto ‘quiet’ as only a handful of background seismicity, often not felt, are reported. This has generated safety concerns regarding potential risk due to seismicity, mostly shallow, resulting from anthropogenic activities as they could produce large amplitude ground motion. The safety concerns are justified, however, they often cause discord between industry operators and the public. Do induce earthquakes behave similar to natural earthquakes? What source scaling relationship govern induced seismicity in our study area? How can we improve our detection of induced microseismicity? Can induced earthquakes help to identify fault structures including ‘blind’ faults? Is the double-couple assumption adequate to model slip/rupture induced by hydraulic fracturing operations? Can we lower the magnitude threshold of resolved fault plane solutions of induced events in regions with limited seismic station coverage? What orientation of crustal stresses drive deformation in our study area? How does the orientation of fault structures relative to injection well direction influence number and magnitude distribution of induced earthquakes. How can we modify hydraulic fracturing operational parameters such as horizontal wells direction and injection rate, to achieve balance between maximizing production and minimizing static shear stress enhancement on faults during injection runs?